I participated with the Virginia Wine Meet-up Group in a Wine Tasting at Chrysalis Vineyards in Virginia. This was my first meeting with the Virginia Meet-up Group. Meet-up groups are a great thing. There are many of them worldwide. Each Meet-up group has an administrator, who orchestrates the activities. One just signs up via the internet platform and then easily arranges his or her participation in the meetings via the internet. There is no fee. There are currently 1463 wine meet-up groups in the world with 467650 members in 526 cities in 21 countries. See here. 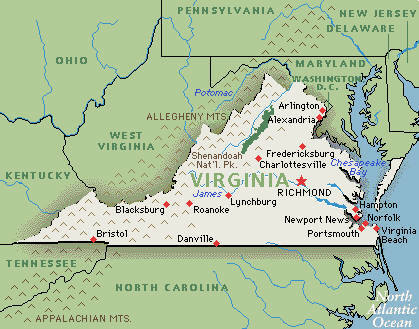 Virginia is the 5th largest wine industry in the US, with nearly 200 wineries and 2,500 acres of vineyards. Over the past 50 years, Virginia wines have experienced a tremendous development - to elegant and balanced, mostly European vinifera-based wines. As far as white wines are concerned, the European vinifera grapes Chardonnay and Viognier are the leading varieties today. Increasingly they are made “naked” or with little oak only, with the objective of retaining natural acidity and freshness. For hybrid varieties, Seyval Blanc is still popular, but resembles now the fresh and crisp wines from France’s South West. Vidal has become the backbone of the artificially frozen ice wine, which I am not a great fan of. The first ice wine was reportedly produced in Germany in 1794. Today, ice wines are highly prized wines that are made not only in Germany, but also in Austria and Canada as well as other countries, including the United States. Canada has experienced an amazing ice wine boom in the past decades. See about German and Canadian ice wine here. In the context of ice wine, some wine regions, including Virginia, are pushing cryoextraction. This is an approach, which kind of simulates the frost in the vineyard in the wine cellar. It was developed by the French. Instead of waiting for mother nature to produce frosty temperatures in the vineyard, the winemaker subjects the grapes to frosty temperatures in the cellar and presses them while frozen. As far as red wines are concerned, there was a shift in top Virginia reds from straight varietal wines to blends. And blends have gone from being dominated by Cabernet Sauvignon to Merlot and Cabernet Franc, with a significant amount of Petit Verdot. The latter grape may well be Virginia’s future signature style in this category. There is an increasing focus on neutral oak and clean, vibrant fruit, mirroring the evolution of Virginia white wines. Tannat, Uruguay’ signature grape from the South West of France, is showing up in more Virginia wines, usually as a blend. The only red French hybrid which has performed consistently well in Virginia is Chambourcin, which, with its bright cherry aromas and flavors, crisp acidity and low tannin, resembles the Gamay grape of Beaujolais. In Germany, a new grape variety, Regent, has been developed as a crossing of Diana and Chambourcin, which is exceptionally fungal-resistant and hailed to be the first “green” grape. Finally, Virginia sparkling wine from Claude Thibault was served at President Obama’s first state dinner a few months ago. While respectable sparkling wines have been made in Virginia in the past, sparkling wines have been taken to a new level in Virginia by the work of Claude Thibault, a native of Champagne. Thibault now consults for a number other Virginia wineries and produces his own sparkler, NV Thibault-Janisson, made from 100 percent Chardonnay, which President Obama offered his guests at the state dinner. Chrysalis is owned by Jennifer McCloud, who moved to Virginia in 1996, after a very successful career in the internet industry. She says that she had a dream and settled in the Piedmont area in Virginia to make her dream a reality. Chrysalis Vineyards -- named symbolically for the rare nectar of fine wine emerging from the barrel so as the butterfly emerges from her cocoon -- was born in 1997. Under the guidance of winemaker Alan Kinne, the initial year produced two excellent white wines. The following year Chrysalis Vineyards established its permanent home on the spectacular 209 acres of Locksley Estate alongside the banks of the Hungry Run in Loudoun County. 1998 brought the establishment of new vineyards into full swing, with extensive plantings of Spanish varieties such as Albariño, Tempranillo and Graciano. Other acreage was planted with French varieties, including Petit Verdot, Tannat, Fer Servadou, and Petit Manseng, and the traditional Chardonnay, along with a large planting of the increasingly popular Viognier, until recently grown primarily in the Condrieu region of the upper Rhone valley in France. Norton is the only American grape that makes a really good wine. You have all these wines in California that are winning awards and getting praise, but they're all made from European grapes. Norton is enjoying a resurgence of popularity, and a key element of the Chrysalis Vineyards program is to restore this grape to its position of eminence among fine wines. Presently Chrysalis is believed to have the largest planting of Norton in the world which has 69 acres (28 ha) of the grape. Norton was first cultivated in Richmond, Virginia by Dr. Daniel Norton. Norton bred the grape in the early 1820s and gave it his name. Norton's discovery came just a few years before the death of Thomas Jefferson, whose failure to grow European grapes at Monticello still unfortunately defines Virginia wine for many people. Norton apparently tried to get some of his grapes to Jefferson, but there is no evidence that he succeeded. Norton became available commercially in 1830 and very soon after that came to dominate wine production in the eastern and mid western United States. Since this grape lacks most of the distinct flavors that are typical of native American grapes, it is quite suitable for making dry wine. At the 1873 Vienna World Exposition a Norton wine from Hermann, Missouri won a gold medal. Prohibition ended the ascent of the Norton grape and it got lost. Bootleggers in Missouri saved it from extinction. 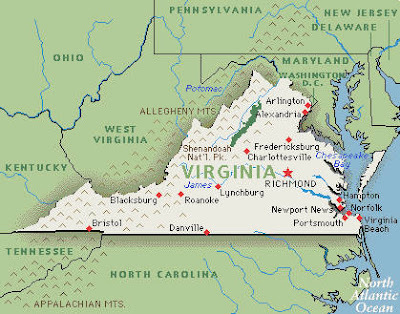 It is now experiencing a resurgence in Virginia. Dennis Horton, owner of Horton Vineyards, who grew up in Missouri in the heart of Norton country, returned the grape to Virginia in the late 1980s. Dennis Horton put Virginia on the world stage with his 1993 Viognier. Jenni McCloud with her Chrysalis Vineyards is currently Norton’s loudest, most bombastic booster. Here is what we tasted with notes by the winemaker. This extraordinary Northern Rhone varietal offers wonderful citrus, tropical and pear aromas, while retaining the classic dry quality of Viognier - eclipsing our award winning 2001 vintage. Unrivaled balance and intensity! Our "flagship" white wine. Fermented sur lie and aged to perfection in French oak barrels and presented in our distinctive antique Burgundy bottles, this Viognier represents the epitome of Chrysalis Vineyards' commitment to excellence in every aspect of the grape growing and winemaking process. Mariposa is the Spanish word for butterfly. Made in the style of a Spanish Clarete from Northern Spain, Chrysalis Vineyards Mariposa is a dry rosé wine which derives its vivid color from Norton, Virginia's distinctive native grape. This is a full-bodied and bold wine, and its bright color foretells its fruity character with fragrant aromas and flavors with hints of raspberry, melon, and cherry. Whether a picnic or pizza, turkey or tapas, our rosé is ideal with light and full fares. Dress it up, dress it down, Chrysalis Vineyards Mariposa is unpretentious, flexible and practical. Sarah's Patio White is named in tribute to Sarah Girtrude Lynn, the patron of Sarah's Patio at our beautiful location in the rolling hills of the Bull Run Mountains. This straightforward and attractive wine offers classic characteristics of citrus and floral aromas, and its crisp acidity is balanced with the right amount of sweetness to create a very distinctive and drinkable wine. The wine in this bottle is unique - unlike any you've ever tasted. Named in honor of our ancestral patron at Chrysalis Vineyards, it's made from 100% Norton, the almost-forgotten great American grape. You'll find the alluring fruit flavors and aromas in this wine simply irresistible. And Norton's natural acidity is in perfect balance with this sweet fruitiness. A revolutionary new wine, Sarah's Patio Red is perfect for all occasions when friends gather to enjoy the simple pleasures of life. We suggest you serve it chilled, to emphasize its fresh fruit flavors and sweet-tart balance. Inspired by the alluring wines of Northern Spain, Rubiana is a Spanish-styled red wine, blended from some of the best varieties grown in this renowned region. Deeply colored, with an intensely aromatic nose of smoke, black fruit, and violets, it displays a firm tannin structure, warmth, and medium body. As it ages, this wine promises to develop its complexity, while it maintains its earthy characteristics. In 1873, at the Vienna Universal Exhibition in Austria, a Norton wine was acclaimed "the best red wine of all nations." Here at Chrysalis Vineyards, we've undertaken a serious commitment to restore Virginia's native grape to its former glory - making wines worthy of international praise. Estate Bottled Norton is a deeply colored, robust and full-bodied wine. We hope you'll agree that this fine wine is another exciting step forward on our mission "To proudly restore Virginia wines to world renown, and celebrate the homecoming of Norton, the Real American Grape!®"
Chrysalis Vineyards grows over 20 different varieties of grapes. This provides a broad range of flavors and attributes to support our view that many of the finest wines of the world are the product of skillful blending. Occasionally, in outstanding years, one of these varieties will distinguish itself with such high quality and intense varietal expression that it warrants being presented on its own. This Petit Verdot, from our Hollin Vineyard, is one of these special bottlings. We are proud to offer this distinctive wine, which exemplifies the full potential that this traditional Bordeaux variety can attain. Hailing from the Madiran region of southwest France, this black-berried grape found a home in Virginia. Perfumed, and layered with smoky roasted meat, leather and cocoa, this complex wine shows a backbone of spicy black fruits with nuances of vanilla, coffee, and background oak. The big structured tannins carry through to a long finish and promise a long life in the bottle. Papillon is the French word for butterfly. This wine exemplifies the balance of understanding the grapes that grow well in Virginia with the finesse required to produce an elegant wine, true to its varietal characteristics. Our blending of several rare and traditional grape varieties of southwest France.has produced a big, fruit forward red, with layers of earthy cedar and coffee, and a touch of pepper. Though this wine is age-worthy, the approachable tannin structure allows for enjoyment now, as well as for years to come. In 1873, at the Vienna Universal Exhibition in Austria, a panel of international judges declared Norton "the best red wine of all nations". Locksley Reserve Norton is our very best - our flagship wine, and one we are, indeed, proud to offer as we continue our mission "To proudly restore Virginia wines to world renown, and celebrate the homecoming of Norton, the Real American Grape!®"
The arguably best place to taste Czech wines in Prague is Vinograf, a small wine bar that belongs to the Hotel Pinot, close by the Charles Bridge on the Castle side. Bar tender Jan Culik speaks German and English very well and is very knowledgable, when it comes to Czech wines. The Czech Republic is a very small wine producing country, with just about 19,000 hectares of vineyards. This is less than Germany’s larger wine regions such as Rheinhessen or the Pfalz. More than 90 percent of the wine production is accounted for by the southern part of Moravia, particularly around the Danube tributaries Dyje, Svraka and Morava. The Moravian wine region is largely concentrated on the border with Austria. It is kind of a continuation of the Austrian “Weinviertel” region in the north-east of Austria. The Moravian Wine Region is divided into four sub-regions: Znojmo, Mikulov, Velké Pavlovice and Slovácko. In Bohemia, north of Prague, vines are planted along the river Labe (Elbe) and its tributaries, totaling 400 hectares of vineyards only. It is a small wine region, although Bohemia acounts for more than half of the Czech Republic. It is one of the most northerly wine regions in Europe. Prague sits on the 50° north latitude, the same as Wiesbaden in the Rheingau. The original instigator of vine-planting in Bohemia was the Emperor Charles IV, who gave it impetus with his decrees issued in the year 1358. The wine region Bohemia is divided into two sub-regions: Mělník and Litoměřice. No wine is grown in Czech Silesia, the third of the three Czech regions, in the north-east. About three quarters of Czech wine production consists of white varietals. The primary varieties are Muller-Thurgau, Pinot Blanc (Czech: Rulandské bílé), Gewürztraminer (Czech: Tramín červený) and Grüner Veltliner (Czech: Veltínské zelené). Typically, Czech white wines are dry, aromatic, and light wines. There are also red varietals such as Frankovka (Blaufrankisch), Modrý Portugal (Blue Portugal, named after the grape, not the country), or Svatovavřinecké (Saint Lawrence). Vinograf is a cosy wine bar in Míšeňská Street , the only street in Prague built entirely in baroque style, very close to Charles bridge in Malá Strana. Charles bridge is the oldest bridge in Prague. Charles Bridge replaced the former Juditin Bridge, which was torn down by ice-floes during the spring of 1342. Construction of the bridge was initiated in 1357 by King Charles IV. and was finished in 1402. Until as late as the mid-1800, Charles Bridge was the only bridge in Prague and a key stop on the routes through Europe. Throughout its history, the bridge was decorated by 30 statues and sculptures. There are about 8 tables for not more than 20 or so people. It's quite small, square, quite simple in decor, with white-painted vaulted ceiling, artfully-placed bottles and menu boards. The wine portfolio contains about 100 bottles. Most of them are from the Czech Republic, but Vinograf also carries a few international wines. Vinograf is also a wine shop where you can pay to go as you would do in your usual wine shop. The wines on the shelves have both prices displayed, the one to go, and the one to drink on the spot. In addition, Vinograf offers about 20 wines by the glass. Most wine bottles are in the Czech Crowns 200 to 300 range. At the time of my visit, the exchange rates were as follows: 1 Euro = 25 Czech Crowns; 1 US$ = 20 Czech Crowns and 1BP = 31 Czech Crowns. The food is simple, tapas-style. We ordered an interesting cheese plate with Czech cheese only. The selection of Czech sausages and ham also looked very good. Vinograf is part the Pinot Hotel, which is inexpensive and nicely renovated. We did not stay there, but the Pinot Hotel appears to be THE hotel for wine lovers in Prague. It has entered into partnerships wine Czech wineries; each winery sponsors one room. Hotel Pinot has an interesting wine cellar, the Lustermannský wine cellar, which is used for wine tastings and other events. Hotel Pinot currently offers two wine lectures on Czech wines: The Wines of the Czech Republic and International Grape Varieties in Czech Conditions. Each lecture lasts for approximately 60 minutes. The lecture can be in Czech, English, German or French. It must be arranged at least two days in advance, but Hotel Pinot is very flexible in terms of the time. The Wines of the Czech Republic: This lecture focuses on the basic facts of winemaking in the Czech Republic. You’ll get to know the Czech system of wine classification and taste typical Czech grape varieties. The wine tasting includes 8 samples of white, rosé and red wines. International Grape Varieties in Czech Conditions: This lecture focuses on the well-known international grape varieties. The tasting includes ten samples of varieties such as Sauvignon Blanc, Riesling, Pinot Gris, Pinot Blanc, Chardonnay, Pinot Noir and Merlot or Cabernet Sauvignon. You will always get two samples of each variety from two different places, which will make it easier for you to tell the difference. Hotel Pinot also organizes wine excursions within Prague and to the Bohemia and Morovia wine regions. Vinograf has a wine blog www.vinograf.cz and is on facebook. What I have seen there is mostly in Czech but looks very interesting. Apparently, the videos include interviews with winemakers and clips from tastings as well as thematic clips on issues such as wine and food pairing. The Decanter of August 2010 contains an interesting, but unfortunate report about a panel tasting of dry German Riesling Kabinett wines from the vintage 2009, written by Freddy Price, wine writer and author. The report is full of mistakes and suggests that the author and the Decanter, which uses the subtitle "The world's best wine magazine" on its front page know little about the intricacies of German wine. I will first discuss the unfortunate Decanter Report about dry German wines and then quickly present the Decanter ratings. Price writes that “ the German Wine Law of 1971 classifies wines based on the weight of the grape must, without reference to the quality of the wine. Wines included in this are known as Praedikatswein , meaning wines with distinction”. While the first part of the statement is correct, the second is wrong. The wines that fall in the Praedikatswein groups are indeed included in the German Wine Law of 1971, but account for only less than 50 percent of the total. The other very important group of wines, accounting for more than 50 percent of the German wines, are so called “Qualitataetsweine besonderer Anbaugebiete”, or QbA wines. Price ignores the QbA wine group and the difference between Praedikatswein and QbA wines; this is a major weakness of the article. The distinction is key to understanding the German Wine Law of 1971 and the reasoning of the VDP association, which Price also discusses. Price goes on “since the must weight is chiefly dictated by the grape’s ripeness and hence sugar level, the scale gives a broad indication of the wines sweetness. Kabinett is the first (driest) level, followed by Spaetlese and Auslese”. This is wrong. The sugar level at the point of harvest has nothing to do with the sweetness of the finished wine as far as QbA and Praedikatwein up to Auslese are concerned. These wines can potentially be bone dry or very sweet in the glass, although the sugar level at harvest was exactly the same. Price apparently does not understand the link between the sweetness of a grape at harvest and the sweetness of the finished wine: During fermentation, the sugar in the grape turns into alcohol and CO2; the level of the sugar in the must goes down while the level of the alcohol goes up. Once a certain level of alcohol is attained, around 13 to 15 percent, the fermentation process stops naturally and the unfermented sugar remains in the wine. For 95 percent of the grapes harvested in Germany, without additional effort of the wine maker, no unfermented sugar remains in the wine and the finished wine will be bone dry. Grapes harvested at QbA, Kabinett, Spaetlese or Auslese level do not have enough sugar to produce a wine that is sweet, if you just leave it to mother nature. Grape sugar only remains for the group of noble-sweet wines, i.e. Beerenauslese, Trockeneweerebnauslese and Eiswein. However, in reality, there are plenty of sweet QbA, Kabinett, Spaetlese and Auslese wines. How does that happen? First, stopping the fermentation; this is typically done through a skillful manipulation of the fermentation process with sulfur and temperature control. The winemaker needs to follow closely the fermentation process and must make sure that it comes to a stop at the desired level of sugar. Both methods are used and perfectly legal. Price writes: “Chaptalisation (the addition of sugar) is not permitted.” This is wrong. What is not permitted is to add sugar to the must, if these wines are sold at the Preadikatswein level, that means as Kabinett, Spaetlese, Auslese, Beerenauslese, Trockenbeerenauslese or Eiswein. But chaptalization is permitted for wines at the QbA level and below, which account for more than 50 percent of German wine. These wines can be chaptalized and indeed are. However, the purpose of chaptalisation is not to increase the sweetness of the wine, but the alcohol content of the wine. Remember, sugar turns into alcohol during fermentation. In addition, and this is very important, Praedikatswein, though not allowed to be chaptalised, can be made sweet(er) by adding Suessreserve (sterilized juice). Adding Suessreserve to increase the sweetness of the finished wine is perfectly legal in Germany, within certain limits. Price writes: “Now the VDP (Association of German Quality Wine Estates) is introducing a rule for its members , dropping the word Kabinett for dry or trocken wines and retaining the term Kabinett for those with residual sugar above 9 gram/liter. “ There is nothing wrong with this, but Price doesn’t capture the big picture. Basically, under the VDP approach, first, all dry wines are labeled as QbA wines. The level of quality is then expressed by the terroir principle; the narrower the specification, the higher the quality of the wine is. The top dry wines are marked, in addition to being QbA wines, as Grosses Gewaechs or Erstes Gewaechs wines. Second, for sweet wines, the traditional wine classification of Kabinett, Spaetlese and Auslese is maintained, and of course, also for the noble sweet wines. When the consumer buys a Kabinett, he or she knows that it will be a sweet wine. Thus, in the VDP framework, a Kabinett trocken is a thing of the past. A dry wine that based on the sugar content at harvest is in the Kabinett range, will be labeled as a QbA wine. The quality of the wine will then be indicated by the narrowness of the terroir specification, in line with for example in the Bourgogne in France. One wine stands out: Gunter Kuenstler’s Kabinett wine from Hochheim. It is the only wine that received five stars. 18 wines have been awarded 4 stars. Here is the list. There are about 40 3 star wines, 10 2 star wines and 2 1 star wines. They are all listed in the print edition of the August 2010 Decanter issue and they 3 star wines are also briefly reviewed. How does a Sweet German Riesling Become Sweet? I had the opportunity to participate – with the Weinfreunde Hochheim - in a dream tasting at Weingut Saxer in the German speaking part of Switzerland – at a long dinner table in the Saxer vineyards. Switzerland is a small wine producer with about 15 000 hectares of vineyards. This is about 15 percent of Germany’s total winegrowing area and a bit more than 1 percent of that of Spain. Only less than 2% of the wine is exported, mainly to Germany. 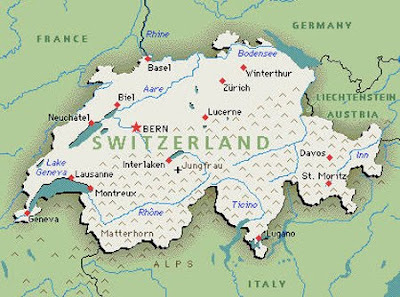 The Saxer Estate is located in the German part of Switzerland, which comprises 17 cantons. Wine is produced in each of the 17 cantons, although the quantities are sometimes small and the vineyards can be widely scattered. The unity of the region comes from its shared Swiss-German traditions. The red grape varieties dominate. One quarter of the vineyard area is planted with Pinot Noir. The white grape varieties, often Müller-Thurgau, only cover 25% of the wine-growing area. The Saxer family has a long tradition in the village of Nussbaumen in Thurgau. The Saxers have always been involved with winemaking, but also with agriculture and dairy farming. With the establishment of a wine cellar in 1974 by Alfred and Verena Saxer, viticulture and winemaking moved to the center. Since 2002, the management has been transferred entirely to the siblings Freddie and Madeleine Saxer. Freddie Saxer takes the lead in terms of viticulture and winemaking; Madeleine Saxer takes the lead in terms of administration and sales. Parents Alfred and Verena are still involved in all aspects of the winery. The Saxer Estate is 500 meters above sea level, which is quite high. They cultivate about 8 hectares, which translates into about 80.000 bottles per year. Most of the wine is sold at the premise directly to the consumer. The Saxer’s wine portfolio consists of about 20 wines. 8 of them are white wines, all of them dry. I liked very much the 2009 Nussbaumen Mueller-Thurgau for SFr 13.30, the Saxer’s white flagship wine; it was clean, crips and fruity with a long finish. The grape variety Mueller Thurgau was created in the 1800 by the Swiss Hermann Mueller from the canton Thurgau - hence the name - in Geisenheim, Germany. The Saxers have also started to grow Gruener Veltliner, which is a mainstream grape variety in neighboring Austria, but not much known in Switzerland. Alfred Saxer bought the vines from his colleague Bruendlmayer in the Kamptal area in Austria a few years ago. Among the 12 red wines, Pinot Noir dominates. But I could also detect some Regent and Dornfedler in blends. The 2008 Erdwein Pinot Noir stood out; this wine was stored two meters below surface in a 225 liter barrique barrel for a year before releasing the wine. The story is that in the 30-years war the winemakers burried their wine barrels in the ground to hide the wine from the soldiers. When they unburried and consumed the wine, they found Erdwein had added flavors and tasted very good. 3 Saxer barrique barrels are in the ground right now. The Erdwein costs SFr 32. The wine portfolio is complemented by a sweet Pinot Noir wine, a rose wine and a sparkler, brut. The Saxers also produce brandies from various fruits. The Hochheimer Weinfreunde were able to taste the wonderful Saxer wines in an extraordinary setting: At a long dinner table right in the middle of the Saxer vineyards in the later afternoon. Karl Heinz Johner is owner of and wine maker at the Johner Estate in New Zealand. He also owns Weingut Karl Heinz Johner in Germany, in the Baden region. Both Estates are co-owned with his son Patrick Johner, who also is a wine maker and a Web 2.0 leader in the German wine industry. Patrick focuses on the German operation, while Karl Heinz is in the lead in New Zealand. Karl Heinz Johner was born in Germany. He studied Oenology and Viticulture in Geisenheim, Germany, and graduated from there in 1973. He then spent many years in England, making wines at the Lamberhurst Vneyard in Kent. I fact, he was one of the first, if not the first to produce English sparkler, which are increasingly gaining international recognition. In 1985, Karl Heinz Johner and his wife Irene returned to Germany, when their son and their daughter had to go to school,. 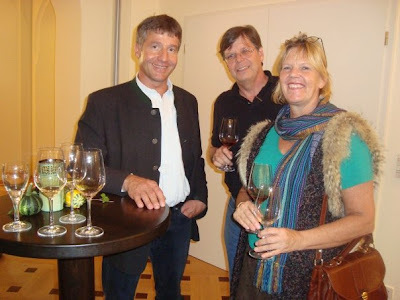 They founded a little Weingut in their home village Bischoffingen in Baden. The Karl Heinz Johner Weingut quickly established itself as a top wine producer in Germany. Today, Weingut Karl Heinz Johner has 3 Gault Millau Grapes. It is however no longer managed by Karl Heinz; his son Patrick is in the lead there, assisted by his mother. Karl Heinz manages the Johner Estate in New Zealand, where he spends a large part of the year. Johner Estate is outside of Masterton in the northern Wairarapa Valley. 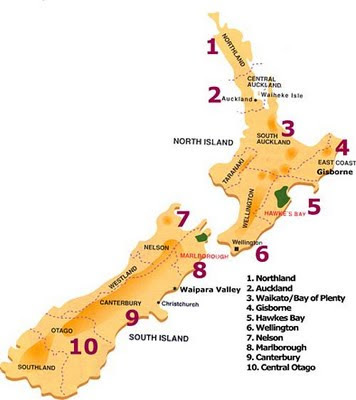 Wairarapa is a young wine growing region north of Wellington. The Johner Estate has planted 8 hectares of various Pinot Noir clones, originally selected in Burgundy, 3 hectares of Sauvignon Blanc and a further hectare of 10 trial Varieties ranging from Pinot Gris to Syrah. Among the factors that contribute to the high quality of the Johner Estate wines, the following should be mentioned: alluvial free draining gravel, a cool maritime climate, low rainfall, high density planting (2000 vines/acre), open cultivation, an intense vine tending and green harvest, and very low yields. 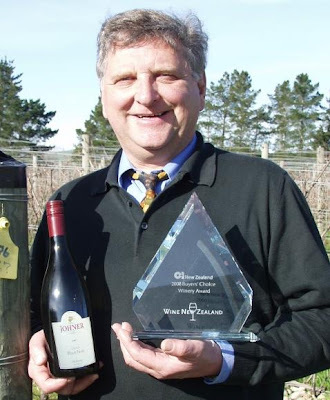 This year, for the first time, the New Zealand Johner Estate was included in Mathew Luke’s Classification of New Zealand’s Top 60 Pinot Noir producers. See more here. Karl Heinz’s son Patrick focuses on the German operations, including selling the New Zealnd wines in Germany. I first got in touch with him through the internet, where he is one of the driving forces in Germany’s wine industry. Earlier this year, he organized a fascinating twitter wine tasting on Ustream.tv with a Skype connection to Karl Heinz in New Zealand. First, there was Patrick Johner sitting in the office of his winery in Baden, Germany, behind a monitor and with a head set on his head. He was orchestrating the whole show and broadcasting live through Ustream.tv. Second, Patrick was connected via Skype with his father Karl Heinz in New Zealand, who was also on-line. During the show, with his lap –top, connected to Ustream.tv via Skype , Karl H. Johner was walking in the vineyard showing us the grapes, then showing us his cellar and finally also drinking the wine, while commenting on questions and remarks. Amazing pictures! Third, there were the viewers like me. Many of the viewers had ordered the wine before the show and were tasting with Patrick Johner and his father the Sauvignon Blanc from New Zealand. The viewers were watching and hearing the father in New Zealand in one window of the screen and Patrick in Baden in another window. They were all in their twitter accounts and sending out notes and questions via twitter. We were all reading the tweets, including Patrick Johner. He would select the more interesting ones and share them with his father. Then, his father would answer from New Zealand or Patrick would answer from Germany. All this was streamed live on Ustream.tv. On the occasion of its 100th Anniversary, the VDP has put together 100 cases with a selection of 12 outstanding wines from VDP members. It will auction these cases off. The wines are all Grosses/Erstes Gewaechs wines. Three of the wines are Pinot Noirs from 2007, the rest is Riesling from 2008. The Grosse Gewaechs and Erstes Gewaechs wine concepts were introduced a few years ago. These terms basically mean the same thing but for some reasons the latter is used in the Rheingau and the former in all other wine regions. Grosse/Erste Gewaechs wines are always fully fermented, dry wines of execeptional quality . The Grosse/Erste Gewaechs lable is thought to resemble the Grand/Premier Cru designation in neighboring France. Here and there, these wines are dry. Grosse/Erste Gewaechs refers to a top dry wine from a top vineyard. It should be noted that as a rule Grosse Gewaechs and Erstes Gewaechs wines are always sold as QbA wines – Qualitaetswein besonderer Anbaugebiete. QbA wines, under German law, are allowed to be chaptalised, with the purpose of increasing the alcohol content of the wine. More generally, under the new classification system of the VDP, all dry wines are systematically labeled as QbA wines. The winemakers are among the the crème de la crème winemakers in Germany, the VDP.. The 200 members of VDP own 4,000 hectares of vines, representing 4% of the German vineyard area, but account for only 2% of total production. Typically, around 1.0m bottles of their production qualify as Grosses/Erstes Gewächs wines every year, representing about 3% of the output of the about ¾ of the members of the VDP producing Grosses Gewaechs and Erstes Gewaechs wines. Interestingly, among the 10 winemakers, there is not a single winemaker from the Mosel, as the Mosel is focusing more on producing world class noble sweet wines. The wines in the case are all Grosses Geweaechs and Erstes Gewaechs wines and are thus bone dry wines. Bidders should not expect sweet wines. The bidding is being done electronically and has started on May 1. 2010. The minimum starting bid is Euro 750. Those interested in placing a bid may do so by contacting the VDP headquarters in Gau-Algesheim. The offer is limited to one case per person. Successful bidders will be announced on 26 November, the founding date of the VDP, during the centennial finale. The proceeds will go to the Beckenbauer Foundation, a charity for the needy in Germany. Franz Beckenbauer, Germany’s soccer legend, received the first VDP cult case during of the VDP wine ball in Wiesbaden on April 24. Michael Prinz zu Salm-Salm, honorary president of the VDP, presented the exclusive edition to Beckenbauer, who promised to auction it to the highest bidder. I had the pleasure to meet Winemaker and Owner Tracy Brandt from the Donkey & Goat Winery in Berkeley in May 2010 at the Screwtop Bar in Arlington, Virginia. Located in Berkeley, California, wife and husband winemaking and owner team Tracey and Jared Brandt are pioneers of what they call natural winemaking. 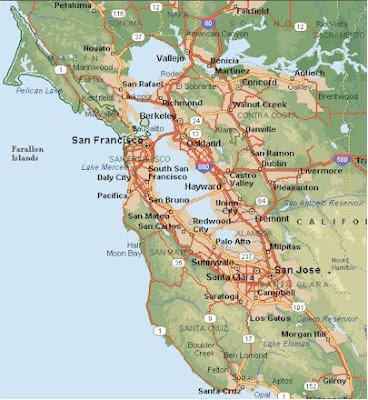 There are no vineyards in Berkeley and they source their fruit from vineyards from the Anderson Valley, Mendocino Ridge, El Dorado and Chalone appellations. The Donkey and Goat Winery is small, producing 2500 cases annually. What is natural winemaking? There is no clear definition for this. An there are many other, similar concepts. The following sheds some light on the concepts of organic, biodynamic, natural and other “green’ winemaking. Vegan refers to the process of "finning" the wine. Proteins, spent yeasts and small organic matter in wines are sometimes eliminated from wines with fining agents made from animal products. Fish bladders, egg whites, milk proteins and even bull’s blood (not allowed in the US or France) are all used as fining agents. As an alternative, Bentonite, a specific type of clay, is used for clarification in vegan wines. It’s important to note that vegan or vegetarian wines may or may not be made from organic grapes. A major aspect of carbon neutrality however is outside the control of wineries. It is the transport of the wine from the winery to the consumer. For example, the carbon dioxide emission would have been less if the guests at the White House Correspondents Dinner had decided to drink wine from Europe that came over to the US via ship rather than wine from California that was transported on the road. In Washington DC, the carbon footprint of the Benzinger wine was not negligible, though Benzinger wines are among the leaders in the green wine movement in the US. Here is what Tracey and Jared Brandt believe in and practice at their winery. No cultured yeast or bacteria – all fermentations are wild. No plastic – all fermentation vats are wood which we prefer for its organic material, insulation and permeability and dimensions. No nutrients, enzymes or other enhancers at the fermentation vat. No prophylactic racking schedules. We stay sur lie as a matter of practice and only deviate when the wine needs a racking. No cocktails disguised as wine – our wines speak of their origin, both place and grape, and belong on the table, not in a cocktail glass. Appellation: El Dorado; Vineyard: Elen Ridge; Varietal: Roussanne; Yield: 2-2.5 tons/acre; Blend: 95% Roussanne/ 5% Chardonnay; Fermentations: wild yeast & bacteria in neutral French Oak barrels; Bottled: Unfiltered on January 29, 2010; Production: 53 cases; Release date: Spring 2010. Winemakers notes: This minuscule 53 case production was an experiment we liked so much we just had to share. We took a barrel from our Elen Ridge lot (the other was joined with Fenaughty Roussanne in our Tamarindo that released Fall 2008). We experimented with an additional seven months of lees contact and while there, extended batonnage (stirring of the lees). Like all of our whites to date, we whole cluster pressed to barrel where the wine fermented without the aide of nutrients or enhancers, employing the wild yeast from the vineyard. Likewise, malolactic fermentation was natural and finished entirely. The cooperage was near neutral French oak. The wine was bottled without clarification, stabilization or filtration. Appellation: Chalone; Vineyard: Brosseau; Varietal: Chardonnay; Elevation: 1600 feet; Soil: Limestone; Yield: 1-1.5 tons/acre; Blend: 100% Chardonnay; Fermentation: 100% barrel ferm, little to no MLF; Barrel aging: 12 mos. in 1-3 year FO barrels; Bottled: Unfiltered on Nov 18, 2008; Production: 78 cases; Release date: Spring 2009. Winemakers notes: With our Brosseau Vineyard Chardonnay we often want for more zippy acidity but the exceptional minerality from those limestone soils keep us firmly rooted in the Chalone Appellation. To compensate, we use an ancient winemaking technique we discovered in the Mâconnais that is also practiced with German Rieslings. At or near veraison we pick some very green Brosseau Vineyard berries from our block. We de-stem, crush, press, filter and then refrigerate until we harvest the bulk of the block in September. At harvest, we blend in a little of the ver jus which naturally increases acidity, lowers alcohol and results in a more complex and vibrant Chardonnay. For the main harvest we whole cluster pressed to barrel where the wine fermented without the aide of nutrients or enhancers, employing the wild yeast from the vineyard. Likewise, malolactic fermentation is natural but does not finish due to the low pH (we do not block with sulfur). The cooperage was a mix near neutral French oak and a 1 year old barrel. The wine was bottled without clarification, stabilization or filtration. Tasting notes: Crushed wet stone, lemon rind, green apple and petrol grab your attention immediately. This elegant and highly focused Chardonnay is unlike most of its domestic peers. It will dance across your palate with lemon zest and pear and the bracing acidity makes this a fabulous companion to anything with butter and all creatures from the sea (think oysters). Vineyards: Fenaughty, Lightner & Girard; Appellation: El Dorado; Blend: 45% Syrah, 35% Grenache, 18% Mourvèdre, & 2% Counoise; Bottled: Unfiltered on Nov 18, 2008; Production: 348 cases; Release date: Spring 2009. Winemaker notes: The thirteen series is our proprietary southern Rhône style blend using up to thirteen of the varietals traditional to Châteauneuf-du-Pape and here we have blended four: Syrah, Grenache, Mourvèdre and Counoise. We are big fans of co-fermentations when mother nature provides the opportunity so the blend includes 4 (of 14) barrels where several varietals started their union at crush. Like all of our red wines, we only use the machine for whatever level of de-stemming is desired (the syrah components include varying levels of whole cluster and whole berry). Any crushing is achieved via pigeage à pied (foot stomping). We do not make wine in plastic. All of our reds are fermented in open top wood vats where wild yeasts are employed without nutrients or other enhancers. We punch down by hand up to 3x daily. The macerations ranged from 18 days for the Grenache to 25 days for the Syrahs Mourvédre in the middle at 23 days). The Grenache and Mourvèdre was aged exclusively in older French Oak barrels. The Syrah components ranged from 1-3 year old French Oak barrels. The Counoise was co-fermented with Grenache and Mourvèdre and aged in a neutral 500L Hungarian puncheon. All malolactic fermentations were natural and completed by early summer. The final blend was assembled in early October and the wine was bottled without fining or filtration on November 18, 2008. Tasting notes: Aromas of crushed fresh berries, clove, forest floor, leather, cola and candied orange peel entice the olfactory. After a few moments, notes of tobacco, game and all spice come to the fore. On the palate this youthful blend offers structure and verve with soft tannins and bright acidity that leave the palate refreshed and ready for more. Appellation: Mendocino; Vineyard: McDowell Valley & Perli Vineyards; Elevation: 950 feet & 1350 feet; Soil: Gravelly loam & clay loam; Yield: <1 tons/acre & 2.5 tons/acre; Maceration: 23-28 days; Barrel aging: 20 mos. in 1-3 yr FO barrels; Bottled: Unfiltered on July 22, 2008; Production: 245 cases; Release date: Fall 2008. Winemakes notes: In 2006 our Vieilles Vignes is a blend of two Mendocino vineyards: McDowell Valley Vineyard and the Perli Vineyard. At McDowell, we have 2 blocks of Syrah, both from the old Gibson Ranch originally planted in 1894. The oldest vines are planted on their own roots and date back to at least 1919. The field blend includes Durif, Carignane, Pelourcin and Aubun in addition to the Syrah. Our other block was propagated from the original plantings in 1948 and budded onto St. George rootstock. As far as we know, these are the oldest Syrah vines in production in California. Further west is the Perli Vineyard, perched atop a hill in the non-contiguous Mendocino Ridge appellation. The vineyard is owned and farmed by Steve Alden who is an incredibly passionate winegrower and loves to experiment which means we became fast friends In 2006 we have fruit from a block called Potato Patch that includes Syrah clones 174 and 877. The vineyards were vinified and aged separately until our final blend was created. Tasting notes: The color is deep blue-violet. The wine possesses an expressive nose of pencil lead, anise, underbrush and leather accenting black and blue berry fruit. The palate on this pure and impressively concentrated Syrah offers impressive muscle and depth with lively acidity and long and silky tannins that coat the mouth for a lush finish. Winemaking: Handcrafted artesian wines using natural & sustainable practices. Weinwelt is one of the half dozen or so German wine journals. Weinwelt is published by the Maininger Verlag in Neustadt an der Weinstrasse in the Pfalz region. Every year, the Meininger Verlag organizes the Weinwelt Riesling Award. For the Weinwelt Riesling Award 2010 – the vintage 2009 – 1300 wines were submitted and tasted during 3 days. These were blind tastings by a 78-member panel of experts, including sommeliers, oenologists, wine growers, wine makers, retailers and journalists. Each flight was tasted twice. In a final test, the 40 top Rieslings were tasted again by an eight member jury and the final ranking was determined. Given the ideal weather conditions in the autumn of 2009, many had predicted that the 2009 vintage would be one of the best in a long time. But this is not the case. 2009 was a good but not an exceptional year. In terms of volume, the 2009 harvest was down by 10 to 15 percent compared with 2008 and with the previous five year average. Tasting notes (in German): Ein Riesling mit viel saftigem Pfirsich und Aprikose, hauchzarter Honignote, rosa Grapefruit, tollem Schmelz und durchgängiger Mineralität. Bassermann Jordan, Buerklin Wolf and Geheimrat von Buhl – the so called 3 “B's” of the Pfalz - have long been considered the top winemakers in the region. They are certainly up there, but others have joined them. The Geheimer Rat von Bassermann Jordan Estate was established in 1700 by Andreas Jordan, who had immigrated to the Pfalz from the Savoy region. In his footsteps came a long series of respected men: Ludwig Andreas Jordan (1811-1883), Representative of the Frankfurt Parliament and the Federal Parliament; Dr. Ludwig Bassermann-Jordan (1869 - 1914), who greatly influenced the first German wine regulations and who co-founded the Association of Natural Wine Producers (later VDP); Dr. Friedrich von Bassermann-Jordan (1872 - 1959) author of one of the most fundamental works on the history of wine; finally Dr. Ludwig von Bassermann-Jordan (1924-1995), who secured a firm position at the pinnacle of the international wine market for the Bassermann-Jordan wines. Today, the Estate is managed and owned by the entrepreneur Achim Niederberger, who also holds other significant business interests in the wine industry. Tasting notes (in German): Insgesamt ein sehr druckvoller und vielschichtiger Wein mit großem Potenzial - sehr eigenständige Nase mit Sponti-Art, kühler Mineralität und eleganter Frucht. Winzerhof Thoerle is a family owned and operated winery in Rheinhessen in the town of Saulheim, with Johannes Thoerle in the driver seat and helped by his parents Rudolf and Ute and his brother Christoph. Johannes joined the winery a few years ago after an apprenticeship, inter alia, with star winemaker Wittmann. The family owns 15 hectares in the Hoelle, Schlossberg and Probstey vineyards in the Saulheim wine region, where they grow mainly Riesling, Silvaner and Burgundy grapes. The historical inn, the “Altes Kelterhaus”, is a cosy setting in which to enjoy a glass of wine, for example at one of the wine dinners that the Thoerles regularly organize. The overwhelming majority of the Winzerhof Thoerle wine portfolio is dry, with both read and white wines on the wine list. I visited the Thoerle Estate a few weeks ago and wrote about it here. Tasting notes (in German): Der trockene Riesling besticht mit kalkig-mineralischer Nase, knackigem weißen Pfirsich, Grapefruit, Mirabelle und kühler Würze, tief, komplex, viel Potenzial. 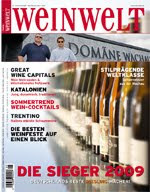 The 150 best wines are listed in the print edition of the Weinwelt of July 2010. You should easily find it at Airports and Railway Stations of large cities in Germany. Additional 650 Riesling wines with tasting notes (in German) are available online. I participated in a presentation of the VDP winemakers from the Nahe, Ahr and Rheinhessen regions in Mainz, Germany. The Verband Deutscher Prädikatsweingüter (VDP, the Association of German Prädikat Wine Estates), founded in 1910, is the world’s oldest association of top-quality wine estates. Nearly 200 wine estates from all German wine-growing regions belong to the VDP today. They cultivate about four percent of Germany’s vineyard area. Membership in the VDP requires voluntary adherence to “in-house” quality criteria that exceed the minimums prescribed by the German wine law of 1971, including: yields are limited and vineyards are planted primarily with traditional grape varieties. Since 1990, 104 estates have become new members in the VDP and 67 winemakers have left the VDP. • Gutsweine (house wines), labeled with a proprietary, village or regional name. • klassifizierte Lagenweine (wines from a classified/superior site), labeled with a vineyard site name. • Erste Lage (wines from a top site), labeled with a vineyard site name and the logo, a numeral “one” next to a stylized cluster of grapes. Only a Erste Lage wine can be a Grosses Gewaechs wine. The Ahr is one of Germany’s northernmost and smallest wine regions, with vineyards extending only 25 km along the Ahr River as it flows toward the Rhine just south of Bonn. The Ahr region has about 500 hectares under vine. Four out of every five bottles of Ahr wine are red wine, mainly Spatburgunder wines. Already since the 17th century the Ahr has been known as a red wine area. The brothers Frank and Marc Adeneuer produce about 80.000 bottle per year, almost exclusively red wine. Wine maker and owner Wolfgang Hehle produces about 60.000 bottles per year, almost exclusively red wine. I like Ludwig Kreuzberg’s “unplugged” red wine. Werner Naekel was the Gault Millau winemaker of the year in 2004; he is considered to be one of the fathers of the German red wine revolution. The 1479 on the label indicates that wine has been made by Nelles for over 500 years. A Bourgogne inspired producer of red wine, with an annual output of 45.000 bottles. The Nahe region is named after the river that traverses the valleys of the forested Hunsrück Hills as it flows toward Bingen on the Rhine . The vines grow along the Nahe River and its tributaries Glan and Alsenz. Although the Nahe is one of the smaller German wine regions, its extraordinary range of soil types is second to none. It has about 4400 hectares under vine. Almost 2000 years ago the Romans brought wine-growing to the Nahe. One of the Grand Seigneurs of German wine; very popular in the US. Picture: Werner Schoenleber (left) and Helmut Doennhoff (right). Armin Diehl also produces Riesling and Pinot Noir wines in Washington State in the US. Another winemaker who is in the 5 grapes Gault and Millau category; Gault and Millau winemaker of the year 2006. A newcomer with a long tradition. Stephan and son Georg Rumpf produce 140.000 bottles of wine annually, almost exclusively white wine. Germany’s oldest family-owned and -managed winery, now by Constantin zu Salm-Salm (32. Generation). The reigning Gault and Millau wine maker of the year. Dr. Martin Tesch’s motto is: dry Riesling and RocknRoll. Rheinhessen is an area that used to be known for winemakers often focusing on quantity and not quality. Rheinhessen is the largest viticultural region in Germany. Every fourth bottle of German wine comes from Rheinhessen. The high-yielder Mueller-Thurgau accounts for about 1/5 of the vineyards. Unlike in other German wine regions, where monoculture of the vine is the norm, here the many rolling hills are host to a wide variety of crops grown alongside the grape. Rheinhessen also has the rather dubious honor of being considered the birthplace of Liebfraumilch. At the same time, Rheinhessen is among Germany’s most interesting wine regions. A lot is happening there. This is not because of the terroir, but because of the people. There is an increasing group of mostly young and ambitious winemakers who want to produce and indeed do produce outstanding wine and not wines in large quantities. Relative newcomer; the Estate with a long history was bought by the Meyer family a few years ago. Ecovin member Battenfeld Spanier focuses on natural winemaking. Ecovin President Lotte Pfeffer-Mueller focuses on natural winemaking. Friedrich Groebe is a traditionalist. Well-known in the US market, with over half of the production being exported. Gerhard and son Michael are great barrique fans. Kuehling-Gillot is managed by Carolin Spanier-Gillot, wife of H.O. Spanier; she is also a proponent of natural winemaking principles. Rheinhessen’s reigning king: 5 grapes Gault and Millau Wein Guide producer Klaus Peter Keller. A red wine producer from Ingelheim. Schloss Westerhaus is situated above Ingelheim with a gorgeous view of the Rheingau on the other side of the Rhein river; in the 1 Grape Gault and Millau category since 2010. Wittmann’s Grosses Gewaechs is the only German top wine in the current Wine Spectator list of 100 (of 2009).